Can't remember your load shedding schedule? Want a 30 minute warning before loadshedding hits? 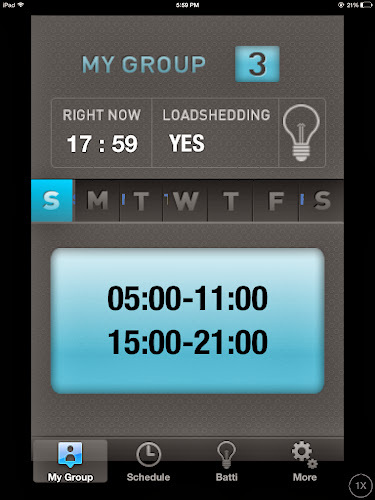 Download the BattiGayo iphone app and have the week's schedule ready to reference and set the alarm to tell you when loadshedding will start and end. So, are these the hours you are without electricity? That's almost the whole day! yes, those are times with no electricity, though we run small things like lights (and our internet) off an inverter so we aren't totally without! No microwaves, hair dryers or anything like that. This is the dry season so load shedding is at its worst, it'll start to get better soon. We have rolling blackouts in Lebanon and there is an for that too! How often are your blackouts?